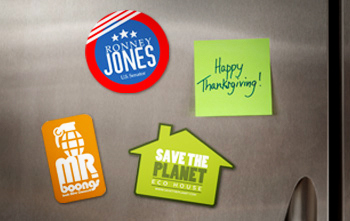 If you want to put a twist on your marketing strategy, then custom magnets is the perfect promotional material for you. With their interactive nature, they are not only functional for posting notes but fun to stick on metal surfaces. This also puts your information visible for when client needs it. Whether your clients use your marketing magnets to hold up a note on their fridge or to decorate their work station, you are making it easier for your customers to remember and reach you. Create your personalized magnets with NextDayFlyers. Choose a shape to suit your needs. Our house-shaped magnets are perfect for real estate businesses and house service companies. Food and retail business can use round magnets for creative photos of dishes and even pizza flavors. Choose one with rounded corners to act as an alternative to business cards that you can use whatever your business is. Print on 20 mil. or 25 mil. magnet stocks. You can expect your order to be ready as soon as the next day! Turn your round magnet into a baseball, soccer ball, volleyball, basketball, or softball to promote a local team or event. It also makes a great promotion for sports bars and sports equipment stores. Fans of these sports would have a very special place for you in their refrigerator doors. For restaurants, you can showcase your dishes, donuts, pastries, and baked goodies using a round magnet. Pizzerias can use them to showcase their different pizza flavors. A pepperoni pizza on your client's fridge will definitely make them crave one and call you. Need a plumber, a gardener, or a carpenter? What easier way to get your business information on your clients' house than with a house magnet on their fridge? Custom Magnets is rated 5.0 out of 5 by 1. Rated 5 out of 5 by mthieman from Exactly What I Ordered What arrived was exactly what I ordered. Perfect. And super quick turnaround time.